If the roof of your mobile home is damaged, leaking, it could be time to consider a mobile home roof over. Your home, after all, is your castle, and you want to occupy it in comfort. You may have considered patching your leaky roof, and certainly that’s one option. However, it is a stop-gap measure, and eventually you’re going to have to consider a reasonably priced replacement. 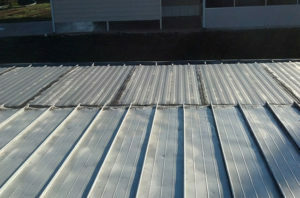 All Weather Roofing, Inc. are mobile home roofing pros, offering the ultimate solution for your leaky mobile home roof. Membrane roofing is one of the best products for mobile home roof overs on the market today. Our TPO (thermoplastic poly olefin) is perfectly suited for low-sloping roofs. It resists punctures, tears, UV light, grease and chemicals, and delivers top performance over the long term. Why Should I Consider a Roof-Over Instead of a Repair? Your roof might not be leaking all that badly right now, and a repair might do the job in the short term. You can expect, though, that over time the leak will recur, and it will get worse. You can patch over and over again, but ultimately, replacement is going to be the only solution. We know it’s less hassle to repair, but if leaks aren’t corrected, they can lead to structural damage. Also, you can bet if you locate one leak, there are others that you won’t find. This can lead to mold problems and further damage. Rather than risk sagging ceilings, unstable floors, wet wiring that could be a fire hazard, and damage to your drywall, it’s better to stop the problem before it gets worse. Once it hits the point where you are seeing visible signs or worse, are slipping on water, the damage is done, and also you could be liable for injuries that happen to visitors in your home. A TPO roof over is a cost-effective solution to a problem that, if left alone, could result in significant damage to your mobile home and endanger your family and friends. TPO roofing systems have been in use for some time, and in fact, this was one of the first types of roofing replacement installed by All Weather Roofing when we started up in 1984. TPO roofing systems that we’ve installed have stood the test of time. For weather-tight roofing, you can’t ask for better. At All Weather Roofing, Inc., we have the experience and expertise you expect in a quality mobile home roof over contractor. We take great pride in the growth our company has seen over the past three decades, and also in the fact that we’re still family-owned. Our reputation for quality products and service has been unparalleled in the Tampa Bay area – quite simply, we’re the best! Feel free to check out our customer reviews. We back up our claim to excellence with an A+ Better Business Bureau rating. Contact us today, and we’ll send one of our trusted representatives to your mobile home. We’ll conduct a video examination of your roof, and show you exactly where we found problem areas. We’ll follow this with an estimate of what needs to be done, and give you a price quote. There is no cost to you for the video assessment or the estimate. Once we’ve agreed on the option that suits you best, you can have your new roof in place in a matter of days. Fill out our online inquiry form or call us at 1-800-297-3758. Our customer service team is there for you 24/7, to answer your questions and arrange for your free video inspection.